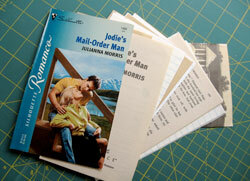 Give new life to used paperbacks by transforming them into handy notebooks! This is a super easy DIY project that will cost less than $1 to make. Step 1: Choose a paperback novel (I decided to go for the romance novel with extra cheese). Step 2: Gather scrap paper. You can use old mail envelopes, junk mail, office paper—anything you can write on. Mix and match with graph and lined paper. 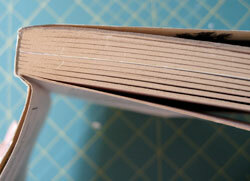 Step 3: With your scissors, cut the front and back cover off of the book as close to the spine as possible. Put these aside. Step 4: Cut out a few pages of your novel. I like to use these pages as dividers inside the notebook. Recycle the spine of the book and unused pages. Step 5: Place the inside pages on a piece of scrap paper and trace the measurements. The inside pages will act as a guide for the width and length of your template and will help you cut your scrap paper to the correct size. Step 6: Use the template and cut your scrap paper to size. An ideal amount is 30–50 pieces of scrap paper, but this can be adapted depending on how thick you would like your notebook. 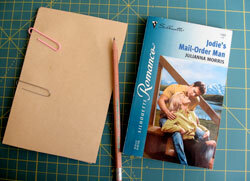 Trim scrap paper so that the book cover and inside pages are the same size. Lay them out the way you want it to look. I like to place my papers randomly—cover, scrap paper, book pages, scrap paper, book paper, scrap paper, cover. 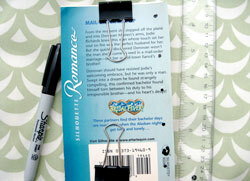 Step 7: Line up your pages and clip them together using two bull clips—one on top and one on the bottom. Take your ruler and mark locations for 5 holes vertically along the left-hand side. One hole in the middle, one each 3/8 from the top and bottom, and the others evenly spaced in between. A sharpie works best when you are marking on a glossy cover. Step 8: Place a protective sheet between your table and your notebook before you begin. 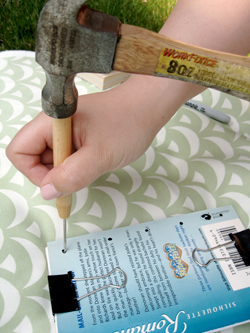 Take your awl, line it up to your marked dots and use your hammer to punch a hole through. Repeat for all 5 dots. Make sure that your hole goes through all the way to the other side and is large enough for your twine to go through three times. 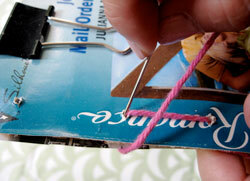 Step 9: A Coptic stitch bookbinding technique is used to hold the notebook together. Feel free to google this technique for step-by-step guides and video tutorials. 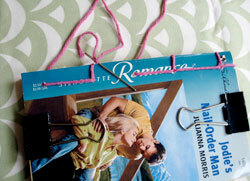 • Cut a length of thread at least four times the height of your book. • Stitch up through the middle hole and leave a couple of inches of thread at the back of the book to tie a knot with later. 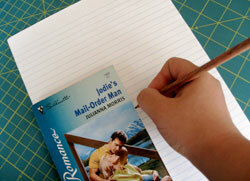 • Stitch down through the next hole towards the top of the book, around the spine and back down through the same hole. • Stitch up through the hole nearest the top of the book, around the spine and back up through the same hole. • Stitch around the top of the book and back up through the same hole. • Stitch down through the next hole towards the centre. • Skip the centre hole and stitch up through the second hole from the bottom, around the spine and back up through the same hole. • Stitch down the hole closest to the bottom, around the spine and back down, around the bottom and back down, up through the hole closer to the centre, down through the middle hole and finally around the spine and back down through the middle hole (sounds more complicated than it is). • Tie the ends together and you are done! This tutorial was inspired by Maked, a local craft collective. Originally posted on Granville Online June 12, 2009.